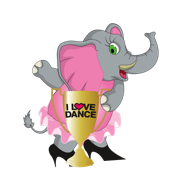 Online Registration is for Dance Studios or Dance Teams only. We do accept Individual, Independent entries by mail or telephone only. Please download our entry form or call our office. Our entries are accepted electronically (space allowing) a minimum of THIRTY DAYS prior to the Competition date. Entry fees to be mailed OVERNIGHT Mail by the next day following making your Online Registration. You may call us with any questions during office hours or email Kim after office hours - kim@ilovedance.com. Q: Why do I get a message that I need to disable blocking of popup windows? A: We use a popup window to display the rules and regulations PDF that you will need to refer to and print and sign. Q: OK, how do I disable popup blocking? A: Below are a few examples of how to do this in popular browsers, but your version of Safari, Internet Explorer, or Firefox may vary. 1. Choose Preferences from the Safari menu and click Security. 2. Un-check the "Block pop-up windows" checkbox. 1. From the Tools menu, select Pop-up Blocker > Pop-up Blocker Settings. If necessary, how do I recover my User Name and/or Password? To protect your privacy, I LOVE DANCE does NOT store or retain your Password. Please make sure you write down this information and keep it in a safe location. If you misplace or lose your Password, I LOVE DANCE cannot retrieve it for you.